Adding pond bacteria and water treatments in ponds and water features requires regular scheduled applications for best results. A busy summer schedule and vacation time away from home can mean that treatments are forgotten or not applied at the right time. 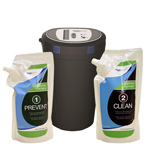 This automated doseing system delivers the correct amount of pond treatment into your pond automatically. 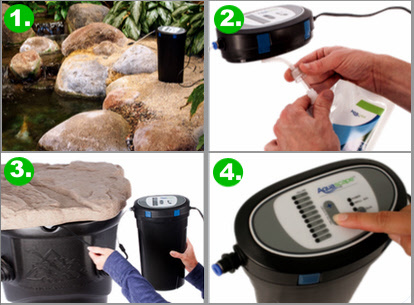 The easy to set system has a control screen and interface so your pond gets the exact amount of product at the right time. 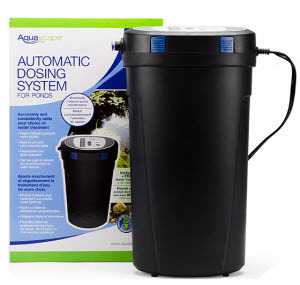 The automatic pond dosing system can treat up to 2000 gallons for an entire month with a single refill pack, smaller ponds can have a single refill last even longer. 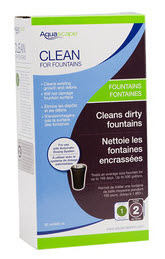 The fountain dosing system will treat most fountains or pondless features for an entire season with one refill pack. 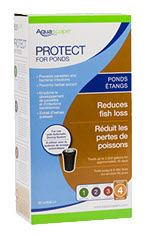 Formulated specifically for systems that contain fish and plants, Aquascape Pond Water Treatments are the ideal way of maintaining optimum waterquality, clarity and an overall healthy pond. 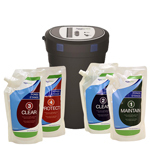 Four different treatment formulations available and each will treat a 2000 gallon pond for up to 30 days. 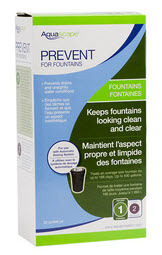 Formulated for water features that do not contain fish and that may or may not be filtered. Aquascape Fountain Water Treatments help to maintain the original beauty of self-contained AquaBasin® fountains, Pondless® Waterfalls or traditional stand-alone fountains. Self-contained water features often evaporate quickly and need to be topped off leaving a large concentration of minerals that will leave unsightly deposits on the surface of the fountain and will over time damage pumps. Aquascape Fountain Water Treatments come in two special formulations to prevent scale before it happens without the use of acids that may damage the surface of the fountain and each water treatment will treat most water fountains for up to one full season. Choose the appropriate water treatment based on what you want to accomplish. Attach the water treatment you have selected to the fitting included with the dosing system. Place the outlet/discharge hose as close to the edge of the water feature as possible. Use the control panel to select the appropriate setting based on the amount of water contained within your water feature. 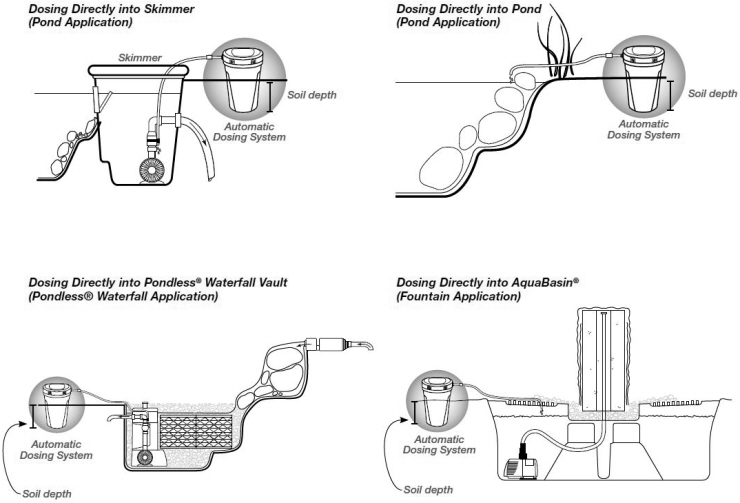 The dosing system will automatically add your selected water treatment product to the pond or water feature every day, helping maintain optimum water quality and clarity. Eliminate the guesswork and routine of adding water treatments to your pond, fountain, or water feature. In order for water treatments to work correctly, or to maintain optimum water quality, water treatments should be added consistently and on a regular basis. Can be used on almost any pond, fountain, or water feature. treatment, one for ponds and water gardens and one for formal fountains outlined below. Each 32 ounce refill is sold separately. 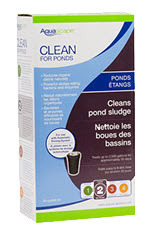 quality resulting in a crystal-clear maintenance free pond. slowly and consistently reducing issues caused when shock treating the pond, resulting in a clean, clear and maintenance free pond. scale often an issue with concrete fountains or in areas with hard water.